I mean. If you were just going to have a short visit. Maybe, ok, it's sort of nice to meet you. But what in the h, e, double hockey stick are you? Like. Literally. Are you an abscess? A boil? A cyst? 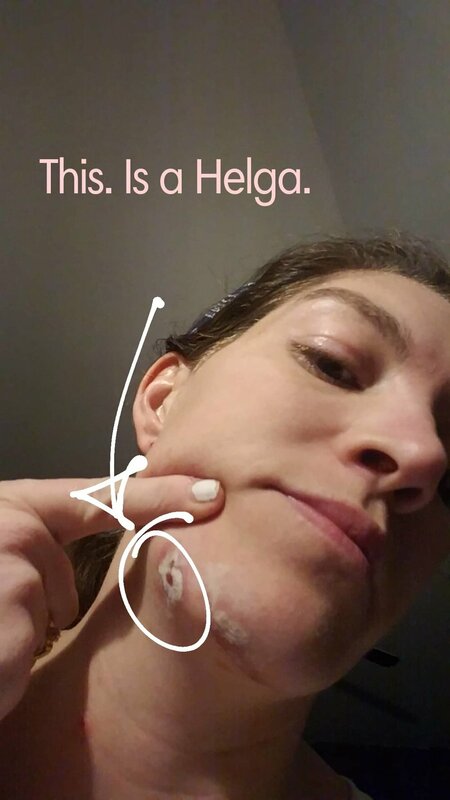 Cystic acne? What?!? You know what? I really don't care. Just go away. I mean, 6 months is too long to be hanging around. I have tried as many natural things as I can think of to let you know you need to leave. Essential oils: frankincense tea tree, lavender, oregano, white thyme. Drawing items: castor oil, activated charcoal, bentonite clay. Homeopathy: belladonna, calcium something, and hepar. Colloidal silver: internal and external. Although the ImmunoVen and Manuka honey seems to have had the best reaction. With those at least whatever Helga is, she expelled something. Albeit a gross something. And I am not even going to go into detail as to what the stuff looks like. GROSS. Right here she is wearing a castor oil and bentonite clay salve. I had her down to nothing with salves and Immunoven but she decided she didn't want to leave. So she came back with full force. Doubled her size AND decided to bring a couple others with her. BLAST HER. So I am on another trip to the local health food store to see the fabulous Paul at Health and Nutrition Plus.